Do you walk into your bathroom everyday and think, “I hate this room, but it’s so small, what can be done?” For the most part, unless you are going to tear everything down, re-route pipes or enlarge the house, your bathroom, with the toilet next to the sink and the bathtub right across from it, is going to stay that way. BUT, that doesn’t mean you can’t remake the way a bathroom looks! It’s hard to organize a bathroom when there is a cabinet only under the sink. You can only fit so much. But, are you leaving space unoccupied above the toilet or on a wall that might not have a window? Take a look at all the walls in the bathroom you want to makeover. Is there space? Measure it and consider custom cabinets to fill that space. You could dream up your own idea, let one of our custom millworkers help you with some ideas or take a look at the cabinets we have in our showroom that might work. Different styles of sinks are one of the many things you’ll find displayed in our showroom. Changing out your sink is an easy way to change the look and feel of an entire bathroom. The basics are installed when a home is built and many people don’t even consider changing those basics out when they move into a home. By simply adding a new sink and cabinets along with a new splash of paint on the walls, you’ll have a new room! Think of how much time you spend in the bathroom. Wouldn’t you want to enjoy being in there? This would certainly require more work and possibly the help of a contractor, but adding a window to the bathroom is guaranteed to change your feelings about it. We can help with a window addition. It’s something to consider if you really want to have something new! Go ahead, spend some time in the bathroom and figure out what you would like to change. Then visit us here at Brunsell and we will help you with your bathroom makeover! 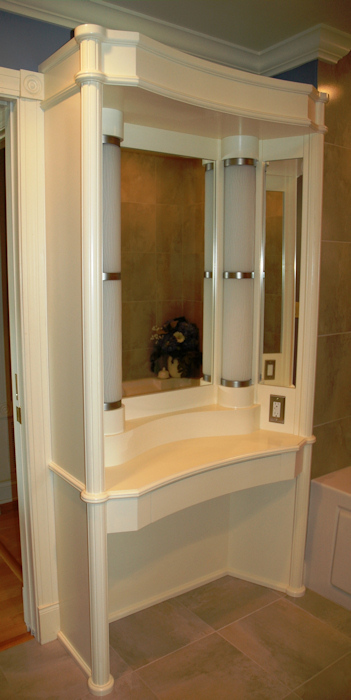 This entry was posted in Bathroom and tagged Bathroom makeover, bathroom organization, bathroom sink, Bathroom vanity, Custom Cabinets, Custom Cabinets Madison. Bookmark the permalink.